'Wee Viking' (Anthony and Dorothy Willott, R. 2004). Seedling #W 03-11. MDB, height 5" (13 cm). Early bloom. 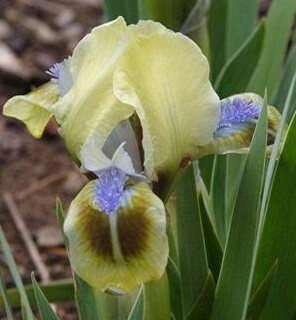 Light greenish yellow self, light red-brown spot on falls; beards large blue-violet; dainty foliage. 'Silk And Velvet' X 'Little Drummer Boy'. Willott 2005.